On 3 April 2019, the Department of EU International Relations and Diplomacy Studies hosted an alumni roundtable in Bruges. 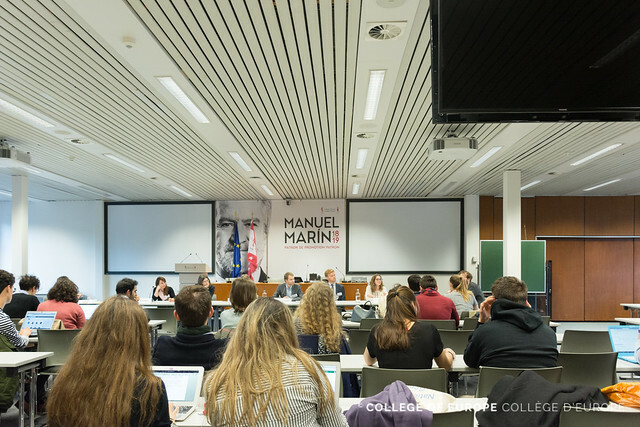 Graduates from the programme working in different sectors shared their post-College experiences on the job market and provided very practical career advice to the current students of the Manuel Marín promotion. The participating alumni were Lilia KAMENOW (Polish Representation to the EU, Marcus Aurelius promotion 2008-09), Camille LEPINAY (Brussels Agency for Business Support, Charles Darwin promotion 2009-10), Adam KAZNOWSKI (European External Action Service, Voltaire promotion 2013-14), Thomas JACOBS (Ghent University, Frédéric Chopin promotion 2015-16), Elise CUNY (Egmont Institute, John Maynard Keynes promotion 2016-17), Yulya SUDZILOVSKA (European Endowment for Democracy, John Maynard Keynes promotion 2016-17), and Marc Nikolov (European Commission, Simone Veil promotion 2017-2018). The event was followed by a networking reception.